Edith White Tisdall was born in 1905 in Vancouver, British Columbia. Her entrepreneurial father was a gunsmith and retail merchant; by the time she entered the UBC School of Nursing in 1923, he had served two terms as a Member [Conservative] of the Legislature in Victoria, and now was a mayor of and long-serving alderman for Vancouver. At UBC, Tisdall was nicknamed "Toddy", and was active and involved in campus activities, including the Players' Club, before she entered the clinical portion of the Nursing program at Vancouver General Hospital. 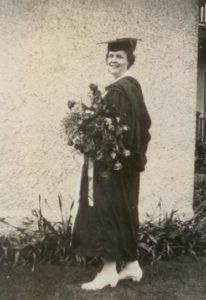 She graduated from both UBC and VGH in 1929. As one of the early UBC Nursing graduates, she embraced the new field of provincial public health and school nursing, moving to Kelowna after graduation to become school nurse for the district. 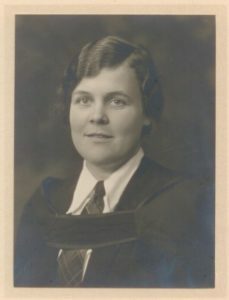 Although she stopped nursing with her marriage to Harley Robertfield Hatfield in 1932, she maintained a lifelong interest in public health nursing and kept contact with classmates such as Muriel Upshall. For most of her married life, the couple and their four children lived in Penticton, where her husband ran a major construction company. He also became involved in local politics and had a lifelong interest in mapping the Cascade wilderness area. Edith died in 1984. The fonds consists of three centimeters of textual records, three UBC graduation photographs and other papers and artifacts dating from 1925 to 1932. Artifacts include an antique silver Nursing Sister’s belt acquired by Edith as a gift from her aunts in Britain.